Tia, as the overseer of the treasury, was one of the top officials under Ramses II. His tomb was used as a mortuary temple to the god Osiris and contains depictions of Tia and his wife making a pilgrimage to Abydos, the cult centre of Osiris. Relief on the wall of Tia's tomb. Remains of columns in the tomb of Tia. Tia was Treasure and Overseer of Cattle of Pharaoh Ramesses II (19th Dynasty). He married the pharaoh's sister, who was also called Tia. Their common tomb was built and decorated between 1290 and 1270 BC. It was constructed in limestone masonry, unlike the earlier tombs on the site that are made of mud-brick. As a consequence, it has suffered greatly from the depredations of later quarry-men. Extant reliefs are scanty and of poor quality, although some retain their original colours. The names of Ramesses II figured prominently on the cornices. 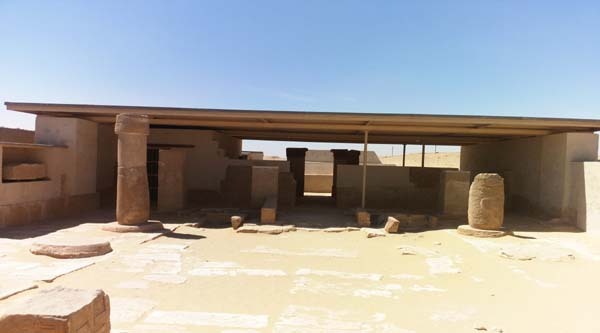 The forecourt and outer courtyard contain shaft tombs of Tia's personnel. One of these, originally belonging to his secretary Iurudef and located on the south side of the outer courtyard, was reused as a mass burial around 1100-900 BC. Tia's own burial, and that of his wife, was approached through a shaft in the inner colonnaded courtyard. These were robbed in antiquity. To the west of the tomb stands the base of Tia's inscribed limestone-clad pyramid. Due to extensive quarrying, fragments of the tomb's decorations were dispersed over the desert surface. Thus the pyramidion capping the pyramid was transferred to Britain as early as 1722. Other elements ended up in Copenhagen and Florence. The tomb was excavated in 1982-1985 by a joint expedition of the Egypt Exploration Society in London and the National Museum of Antiquities in Leiden, under the auspices of the Supreme Council of Antiquities of Egypt. The mud-brick forecourt was cleared in 2005-2007 by the Leiden Museum and Leiden University. In 2007 the tomb's masonry was consolidated and a protective roof added above the most vulnerable reliefs. Finally in May 2011 the tomb was opened to public. It\'s not really much to see there comparing to other tombs of the necropolis, but if you are touring saqqara why to skip it either?